On June 26, 1986 Sitmar owner Boris Vlasov signed a contract with the French yard Chantiers de l'Atlantique for the construction of a $153 million, 1,600 passenger cruise ship along with an option for another vessel. The tentative name was Sitmar Fairmajesty. She was to be Sitmar's answer to the new ships of RCCL and Carnival. In December of that year, the option for a second vessel was canceled and two additional ships were ordered with Fincantieri. On May 28, 1987 the hull named B29 was floated in the St.Nazaire' drydock. Unfortunately on November 2nd Mr. Vlasov (the owner of Sitmar) died. Mr. Vlasov's heirs were soon besieged with offers from the famous British owned P&O to purchase Sitmar. B29 took 32 months to complete, which was 12 more months that the larger Sovereign of the Seas. Difficulties during the construction of the B29 along with the lack of leadership from the Vlasov group lead to the sale of Sitmar to P&O July 28th 1988. The $210 million purchase price for Sitmar by the P&O Chairman, Lord Sterling, was acknowledged as a considerable coup. This addition to the Princess fleet immediately strengthened Princess Cruises. At the time the Princess fleet consisted of three ships. The Fairsea (1956) and the Fairwind (1957) were previous Cunard ships. Princess was also sailing the almost new Fairsky (1984). 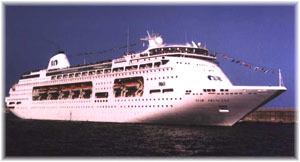 The existing Princess ships were soon renamed Fair Princess, Dawn Princess and Sky Princess respectively. But the primary interest of P&O in the purchase of Sitmar was the existing newbuilding program. Until the purchase of Sitmar P&O did not have any fourth generation cruise ships on order. Their principal rivals Carnival and RCCL already had in service new units of 70,000grt and 1,000 cabins. The only way that P&O could remain one of major cruise lines was to merge with one of their competitors. These three Sitmar newbuilds were somewhat more upscale than the existing Princess fleet but clearly compatible with the P&O fleet. By purchasing into an advanced newbuild program, P&O was able to dramatically shorten the required time needed for introduction of new tonnage into the marketplace. This was a time when demand and competition dictated the introduction of new tonnage without delay. The three new ships was delivered as Star Princess (the former SitmarFairmajesty), Crown Princess and Regal Princess. The interior design of the vessel was entrusted to Ellerbe Becket, a famous architect who had not previously designed a cruise ship. The Star Princess incorporated an atrium four decks high with a splendid, if silent, fountain on the bottom level. The bottom floor of the atrium was also the passenger embarkation point. Princess equipped the ship with cozy lounges in pastel tones. The Star Princess at 90,000 square metres incorporated materials of the highest quality: teak, mahogany, granite, leather, bronze and carved mirrors. The interior decoration also included 300 original works of art including painting, drawings, sculptures and frescos. Mr. Becket decided to put all the major public spaces on the Promenade deck. There are two wide enclosed promenades, one port and one starboard and two open promenades. The main dining room is aft and the main showroom is forward. This design encourages strolling between the two sites. The atrium is a point of reference in the center located nearby is the Casino and an intimate bar, Entre Nous Lounge. The two story high Starlight Showlounge features a large retractable two tiered stage. Seating is arranged amphitheater fashion with 708 individual chairs. The Princess Theater, another cinema and conference room with 200 seats, was located in the same deck as the lower level of the Atrium. The Star Princess was a family oriented ship and boasted one of the most extensive children and teen spaces afloat including its own pool and sun deck on deck 11. The 735 cabins are spacious and well equipped. Ideal for long voyages there is plenty of closet, drawer and storage space. The bathroom are large. The Star Princess was a vessel of striking appearance. She had a sweeping stern and a deckhouse extending well forward. Her bold funnel and wide transom aft presented an appealing. - The lifeboats were located in two three-deck high side recesses. This arrangement meant that life boats are nearer the water line and made the Star Princess the first cruise ship to fulfill the 15 meter maximum height during emergency evacuation. Equally important, it released much valued upper deck space totaling of 7,500 square metres. Much thought was given to the wind flow over these decks and glass wind deflectors have been located strategically. - She was the first modern cruise ship built with a diesel-electric propulsion system. Originally steam turbines were seriously considered but four MAN 58/64 engines which drive a 9,420 KW alternator each were finally mounted. The ship can sail with three engines at 19.5 knots. A single engine running will satisfy the hotel load in port. These engines are resealient mounted and run exclusively with heavy fuel oil. - She was equipped with a great observation salon for the ship's top public room (above the bridge). This lounge was completely circular and was called Windows to the World. In her first days this space was a complete disaster. Only a handful of its occupants could see outside because of the room's raised rim. Only those seated atop the encircling ledge had panoramic views; the rest of the room's occupants saw nothing. A year later this room was renovated raising the rooms centre so that all could enjoy the view. - The only restaurant was divided into small spaces. Seating 800 guests in two sittings the Fountain Court extends through two decks with a large central dome. To break up the area into intimate elements the architects used columns, terracing and booths. A one-deck high pantry also houses four escalators from the galley below. This subdivision of dining areas into small units has been continued by Princess with the so-called "Grand Class" ships but with two restaurants. The Star Princess had an unfortunate first sailing. She was grounded and was immobilized for 12 hours. Upon examination she did not appear to have any hull damage. On March 3, 1989 the Star Princess sailed from St.Nazaire under the Liberian flag. On March 23rd she was christened by Audrey Hepburn in Port Everglades. It was the beginning of a successful career as cruise ship mainly in the US market. Her schedule consisted of winter Caribbean cruises from Fort Lauderdale (with a call in Princess Cays, the Princess' private island) and summers in Alaska. In-between she did Trans-canal positioning cruises. In 1992 the Star Princess cruised the Mediterranean from April 14th throughout November 4th. In total she sailed thirty two cruises, twenty of them were 12-day cruises between Barcelona and Venice. On June 23rd 1995, the Star Princess struck Poundstone Rock while under the control of an Alaskan pilot. She was navigating between the Alaskan ports of Skagway and Juneau during her season of back to back seven day inside passage cruises from Vancouver to Seward returning to Vancouver. She suffered a large gash on the ship's starboard side and sustained damage to the starboard propeller. The vessel's 1,550 passengers were evacuated by ship's tenders and taken by coach to Juneau. Later the vessel sailed to Portland under her own power for dry-docking by Cascade General. Repairs took one month and 210 tons of steel were utilized, in addition, the complete starboard shaft and propeller were repaired. She returned to service August 7, after loosing six cruises. Upon conclusion of the 1997 Alaska summer season the Star Princess cruised through the Panama Canal. She continuing to Belfast to be refitted by Harland & Wolff, the yard that built the Canberra thirty seven years ago. She was retired September 30, 1997 and later was sold for breaking. Constant upgrading had changed some public rooms and added new features and decor. The Canberra had lots of wood paneling and a deep draught. A disadvantage for many passengers was that 216 of her 780 cabins on board did not have private facilities. With the delivery in 1995 of the new P&O's flagship, Oriana, the marketing of the budget priced Canberra become more and more difficult. The flourishing English cruise market did not allow for the long delivery time a new ship would require. Therefore, the decision to incorporate one of the Princess ships was an excellent decision. The passenger capacity of the Star Princess (1,620) is almost the same as the Canberra (1,641). The Star is a ship with relatively high speeds (21 knots service speed and 22.5 top speed). She has an adequate displacement for the crossroads of the Vizcaya Gulf. Her standards could easily reach that of the Oriana after a refit. Her passenger space ratio is almost the same ( 35 pas/GRT on Oriana and 39.2 on Star Princess). Also the large variety of public rooms (a total of twenty four) ample outdoor deck space (7,500 square metres) of the best pool-and-sun area at sea) and unusually large cabins (76% outside and 50 of which with private balconies) make her ideally suited to British tastes. The P&O cruise marketing director David Dingle said in the Internet: "Arcadia is ideally suited to British tastes and we are confident she will prove very popular for P&O passengers". P&O ensured a continuum of design from one ship to the next. The overall responsibility for the refit of Arcadia was given to Robert Tilberg, the Swedish marine architect who so successfully created the Oriana. Mr. Tilberg's branch in UK. is called SMC Design. They had the responsibility of the new Oval with herrick crimsons and buttoned leather chairs. This area has a comfy pub-like atmosphere and recalls the ambiance of Canberra's Cricketers Tavern. They were also charged with the creation of the card room and the remodeling of the Monte Carlo casino (deck 7) and Century's Bars (deck 6). The former Le Grand Casino has been divided into two parts the Monte Carlo Club (decorated in red) and Trums the new card room. As on the Oriana this quiet room is furnished with tables for four ideal for bridge, scrabble and other card games. The Century Bar (the former Serenity on the Star) is an art deco classic bar located in the atrium, opposite Mayfair, one of the three shops on board. Another Swede, Anders Johansson, had the responsibility for the design of the Pacific Restaurant and the Conservatory. The two sittings Pacific Restaurant will continue to be divided into three distinct areas, one along each side and the third sweeping across in front of the aft windows. They are a total of 35 windows in the restaurant so that the whole area is infused with natural light at lunch time. One of her walls is decorated with the Canberra's Maori war canoe. There are tables for 2, 4, 6, 8 and 10 guests. As on the Oriana, the indoor/outdoor dining area has 350 seats. Conservatory (the former Cafe Cornucopia) is another dining choice, it is located around the funnel's base and offers a buffet and also alternative dining on selected evenings. It is decorated in green and cane with delightful floral soft furnishings with green and white stripes. The adjacent pool facilities remain unchanged. The twin pools are separated by a raised deck with a waterfall and swim-up bar and Jacuzzis. Below the radar mast is Al Fresco (a pizzeria) and Sundaes (an ice cream and cocktail bar). On deck 8 adjacent to the formal circle of the Palladium are two new public rooms: the Library (the former Hemingway's) and the Canberra Room (a tribute to her predecessor). Also a new photo gallery has been added to deck 7. The two theaters Stadium and Festival remains unchanged. The former offers British style entertainment (musicals, variety shows, late night revues and plays) and the second with first-run feature films and classical concerts. The Horizon top lounge with her floor to ceiling windows offers entertainment with a central show area and dance floor and a leather trimmed bar. The sound and lighting systems are state of the art. The children's center with night nursery service is now called Peter Pan's. The cabins equipped with mirror, TV and radio remain unchanged. There are European plugs and voltage. The funnel has been painted in P&O's traditional buff color. 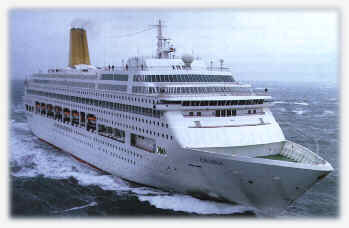 The Arcadia is slower than the Oriana and the legendary Canberra. Therefore, her cruises will take more days and call on fewer ports. The Southampton - Venezia cruise is carried out by Oriana in 17 days with eight calls but the slower Arcadia takes 18 days with one call less. Betty Boothroyd, Speaker of The House of Commons, named Arcadia in a special ceremony in Southampton on the evening of December 19th. Traditional carols and music were provided by the Regimental Band of The Scottish Guards and the choir of Portsmouth Cathedral. A fireworks display followed the naming ceremony. 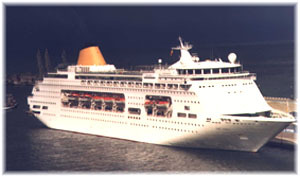 The Arcadia's first cruise departed Southampton on December 23, 1997 and the ports of call were Gibraltar, Canary Island and Madeira. On January 5, 1998 she began her maiden round the world cruise. This 92 night eastbound voyage has been prolonged until June 4th with 26 ports of call including Da Nang, Surabaja and Brunei. Highlights include transits of both the Suez and Panama Canals. P&O will also offer liner voyages to and from Australia. Later she will carry out 21 cruises ranging from 18 nights to Cyprus, to a three night minicruise to France. The great majority of her cruises are designed for the English tastes. Lasting more than ten days and including several navigation days at sea. The Arcadia will also have theme cruises such as the July "pop" cruise when Flower Power will rule the waves with passengers recapturing the feeling of the 60's. The Star Princess was known as one of the finest of the new generation of cruise ships. I think that this legacy will continue and even increase as the Arcadia. Her interior design and decor is ideally suited for British tastes. She will be a perfect running mate not only for the Oriana and the Victoria but also for the new 76,000 GRT superliner that P&O ordered last summer from Jos L. Meyer the German shipyard builder of the Oriana.